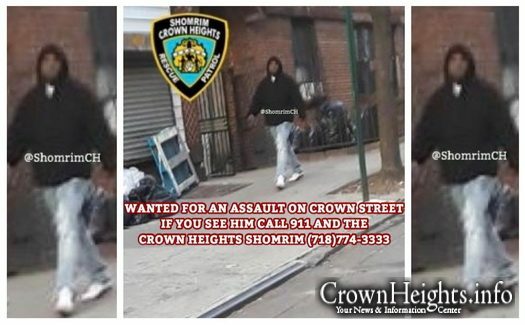 Another senseless assault in Crown Heights left a woman with injuries to her face Thursday. Despite a fast response by Shomrim and the NYPD, the assailant got away. 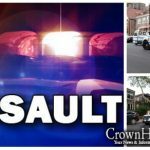 The assault happened around 3:00pm on Thursday afternoon on Crown Street, between Troy and Schenectady Ave. A woman was looking down at her phone when she was punched in the face in an unprovoked assault. The woman was left stunned, and unable to identify her assailant. Shomrim was called, and volunteers were on scene in under a minute, but the assailant had already fled the scene. Luckily, a passing local delivery van had been in the area and witnessed the assault. They had followed the assailant to Empire Blvd and Albany Ave, and returned to the scene with a picture. Armed with the photo, the NYPD and Shomrim canvassed the area but were unable to locate the assailant. Hatzalah was called, and transported the woman to the hospital with facial injuries. 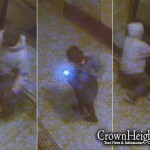 But put your phone away when you’re walking in the street and be vigilant or your surroundings. Victim here. I looked down at my phone for less than 10 seconds because I needed to call my boss. Even if I had been armed and prepared, it was a sucker punch and happened when he was almost shoulder to shoulder with me. Even with catlike reflexes it would’ve been unavoidable. But yes, generally I am fully aware of my surroundings. The assailant was a man.